Seryn is a Dunmer Urshilaku Ashlander and the sister of Chodala. 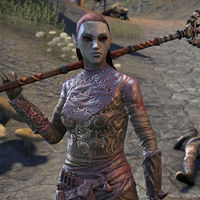 She is critical of the Tribunal and seeks to unite the Ashlander tribes. During the quest Divine Inquiries, she can be found on the road southwest of Ald'ruhn. Go ahead. Ask your questions. Then head into the ruins. I'll be right behind you. Who's Malacath? : "Malacath's an evil god, the Daedric Prince of curses and broken promises. Perhaps that's why Chodala has sought him out. The prophecy of the Nerevarine was Chodala's to fulfill before it was wrenched away from him. 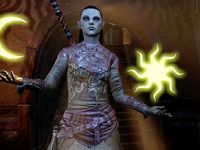 Could Malacath be involved in what's happening to Vivec? : "Perhaps, but I don't think so. The Oathbreaker prefers a more direct approach. He isn't one to hide behind convoluted schemes and plots. Still, if Malacath agrees to support my brother, we'll have one more problem to deal with." I saw you and the Archcanon arguing back in Vivec City. Why have you agreed to help us? : "It's true I have no love of the Tribunal. I also have no stomach for a war between my people and the Great Houses. Too much blood would be spilled for no good end. Even Azura proclaims that my brother must be stopped. I'll help you in any way I can". Why would Chodala seek refuge in a Daedric shrine? : "The tribes rejected him. Azura set her face against him. Now Chodala's seeking aid wherever he can find it. That makes him more desperate than I imagined - and more dangerous. Why he decided to aid Malacath, the God of Curses. I have no idea." This page was last modified on 18 September 2018, at 19:22.